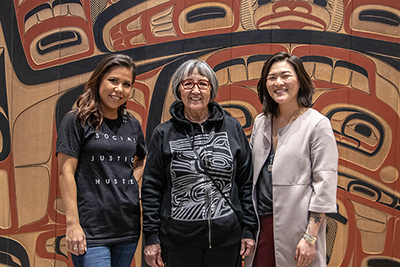 Kindred Post of Juneau today donated ten percent of its profits from its Social Justice Hustle collection to Sealaska Heritage Institute (SHI) in recognition of the institute’s work to forge social change. “Art programs like skin sewing workshops, formline classes, art purchases and youth academies have empowered Alaska Native artists across generations and have educated and enriched our community. I would bet a jar of salmon that there isn't a person in our town who hasn't been impacted by the work you've done,” Eriksen wrote. SHI advocates on numerous social justice issues and in recent years operated a Northwest Coast art program for inmates at Juneau’s Lemon Creek Correctional Center. The goals were to connect Alaska Native prisoners with their cultural identity and to provide a way for them to earn income upon their release. The program will continue pending funding. Kindred Post is a business rooted in art, community and social justice and has four branches of work. As a post office, it connects people and acts as a neighborhood hub for social connection. As a gift shop, it supports more than 150 artists by purchasing their work, sharing their stories with customers, and mentoring emerging artists in wholesale/business practices. As a gathering space, it brings people together through a variety of art and social programming. As a citizen, it uses its rights and responsibilities to serve its community and respond to the world around it. CONTACT: Amy Fletcher, SHI Media and Publications Director, 907.586.9116, amy.fletcher@sealaska.com; Christy NaMee Eriksen, Kindred Post Owner, 907.523.5053, hello@kindredpost.com. Caption: Kindred Post owner Christy Eriksen making a donation to SHI in recognition of its efforts to effect social change. Photo by Lyndsey Brollini, courtesy of Sealaska Heritage Institute.